The Japanese Morinaga Hi-Chew Soda Flavors came as free samples from Tsunami.hk. Look at the lovely effervescence on those wrappers! They came in three flavors: lemon soda, cola, and white soda. If you’ve never had them before, Hi-Chews are individually wrapped, rectangularly shaped chews that are usually fruit flavored. Their chew is bouncy and mostly not sticky, except when you get to the end. 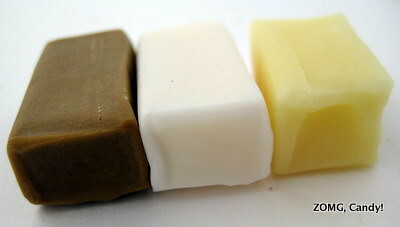 Then they can get really sticky and worm their way into the nooks and crannies of your teeth. Cola was an unappetizing shade of brown with just a tinge of booger-green. Fortunately, its flavor was spot on. It tasted genuinely of cola, with notes of lemon and caramel. Lemon soda was the pale but vaguely psychedelic color of lemon meringue. It had a supremely zesty bite with a hint of pithiness. That light bitterness was nicely ameliorated by the taste of brightly sour lemonade. I really appreciated its complexity and the fact that it didn’t coddle your tastebuds. White soda was the one that was most foreign to my tastebuds. When I tasted it (not consulting my helpful translation notes from Tsunami.hk), I was expecting ramune flavor, which is citrusy. Instead, it initially tasted neutrally sweet with a faint strawberry fruitiness. Then, it transitioned to carrying a hint of liquid sour yogurt, which is a yogurt-flavored drink that you can buy in Asian grocery stores (the name’s literal translation from Chinese is “sour milk”). It was nothing like ramune! Turns out white soda is yogurt flavored. Who woulda thunk it? Lemon soda gets an OM for their tasty flavor complexity. White soda gets an O for being sort of weird but at least interesting! These guys made me wish that American mass-produced candy could be as adventurous as Japan’s sweets! And now, thanks to the mass distribution of Hi-Chew they do (with a bit of a twist). 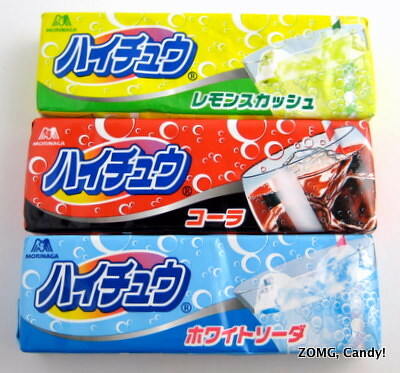 Called Hi-Chew Fizzies, the soda flavors can be found in the US now. I found them at my local Daiso, but was disappointed to see that Morinaga substituted the lemon and white soda flavors with an orange soda one. Luckily Cola stays. Orange Soda, while still good, feels too simple and generic in comparison. I understand that it might more palatable to American tastebuds, but even lemon soda is similar to Sprite, so I’m not sure why they went in this direction. At the end of the day, it tastes only a tad different than your typical orange Hi-Chew. Overall, the Cola flavor gets an OMG, while Orange Soda gets an O. Fans should definitely seek out Hi-Chew Fizzies if they are looking for something a little different! And see how these Hi-Chew flavors rank against others in my Hi-Chew Power Rankings!